Sneeze, Please! is a microgame found in WarioWare: Touched! in the Total Drag stage. It returns in WarioWare Gold as one of Orbulon's microgames. The objective is to move the rolled-up tissue up the nostril to make it sneeze. 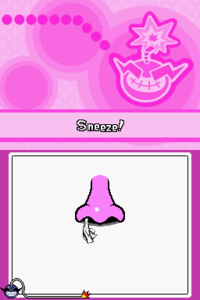 1st level difficulty: The player must make a nose sneeze. 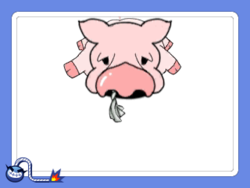 In Gold, the player must make a pig sneeze. 2nd level difficulty: The player must make a nose with a cork in one nostril sneeze. In Gold, the player must make a hippo sneeze. 3rd level difficulty: The player must make a moving nose with a cork in one nostril sneeze. In Gold, the player must make a moving bulldog sneeze. The sound for when the nose sneezes is sampled directly from the public-domain Warner Bros. cartoon, "Porky's Railroad". This page was last edited on December 24, 2018, at 15:38.